Rectify will not be seen tonight, so that Sundance can bring you this special presentation of Two Teds, A Tawney, And A Tire Place. “Until You’re Blue” isn’t as drastic as all that, what with its momentary check-ins with Daniel and Janet, its Charlie Chaplain flashback, and its major breakthrough for Amantha. But the penultimate episode of season two is a reinforcement of just how much work Rectify has done to fill in the blanks surrounding Daniel Holden. It was choppy going for a while (have you heard the good news about Ted Jr. and the rental rims? ), but nearly all of the show’s main characters have since been given a story and a purpose they can call their own. “Until You’re Blue” even makes Teddy’s business-saving scheme matter! Daniel began the second season as the sun around which Rectify orbits; increasingly, he’s become the hub of a wheel, the other characters strengthening into spokes with the strength to support the full weight of the show. (To quote the man himself: “It’s a metaphor.”) That’s never been more apparent than in “Until You’re Blue,” an episode that verges on tawdry melodrama, but not without pulling itself together to set up a potentially explosive finale. That potential (as well as that tawdriness) are wrapped up in what tonight’s episode makes kinetic: The unspoken tension between Ted Jr. and Tawney finally breaks, nearly justifying all of the time the two characters spent in isolation this year. It’s been frustrating to watch so much of the show play out without the Talbots’ input, but “Until You’re Blue” pointedly illustrates the reasons for their quarantine, bringing Tawney to her breaking point while she’s literally backed into a corner. Solitude is one of Rectify’s most powerful themes, but it took an episode haunted by the word “banishment” to make all those disjointed Teddy-and-Tawney scenes sink in. Locked away in this little narrative hothouse, the seeds of jealousy and distrust have grown gnarled and suffocating within Ted Jr. I just wish the scene in which it all starts to make sense didn’t feel so, for lack of a better word, soapy. 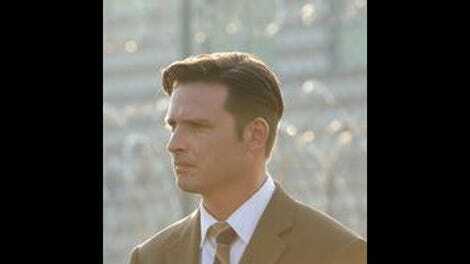 This could be an unintended flaw of the show’s low-key, grounded affect: When the stakes are heightened, when the types of things that happen on other TV shows happen on Rectify, it’s usually with a dose of the surreal. Daniel’s “haircut on the house” from “Plato’s Cave,” for instance, or the “Drip, Drip” assault that became such a plot-driving force in season two. Emotionally potent as it is, Ted and Tawney’s big fight is so direct as to feel alien to this world—a sense that’s underlined by an unearthly bit of scoring. Both Adelaide Clemens and Clayne Crawford are on fire within the scene, but it’s one of those season-two instances in which Rectify tries on the clothes of a different kind of show—this time an unvarnished domestic drama like Parenthood, complete with shaky-cam—and they don’t quite fit. Laid out as a series of meetings between character pairings, it’s the formatting of “Until You’re Blue” that works better. That intimacy is a great look for the show, and what’s essentially table-setting for the finale comes off naturally and engagingly. That’s most noticeable in Ted Sr.’s section of the episode. Bruce McKinnon’s character gets a big load of information he doesn’t want to deal with at the end of “The Great Destroyer,” but he’s a stand-up guy and goes about dealing with that information in a stand-up-guy manner, expressing his disappointment with Daggett and severing ties with Foulkes. “This is a private matter,” he tells the senator, and that sentiment resonates through the abovementioned intimacy of “Until You’re Blue,” be it in Tawney’s miscarriage, Daniel’s plea deal, or Amantha’s fight for her own identity. Melodrama aside, “Until You’re Blue” is a lovely spotlight episode for Tawney and Adelaide Clemens. Clemens puts on the proper level of feigned stoicism following the news from Tawney’s OB/GYN (and with the cold, clinical comfort of the doctor’s explanation, how could she not be? ), making it especially heartbreaking when the façade finally falls. And she’s working with some great writing when Tawney informs Ted of the miscarriage: In the wake of the trauma, there’s obviously only so much of the doctor’s information that she was able to retain. The shots of her idly passing the time in that motel room have a real understated beauty to them, too: If your whole world just crumbled beneath your feet, and you were thinking about making a phone call you could never take back, you might not know what to do with yourself in a Best Western, either. Fantastic establishing shot: The tire store, totally empty, a sign of Teddy’s short-sightedness that bumps up against another sign of his short-sightedness (the phone call with the guy who won’t pay his bill). Tawney: “Am I a bad person?” Daniel: “Of course not.” Tawney: “Are you a bad person?” Daniel: “Yes.” Tawney: “I don’t believe that.” But which part doesn’t she believe? “There’s still time to change Daniel’s mind.” Really, time is all the guy has ever had.